Sometimes I forget just how well stick welding gets a job done. Maybe its because I have been working indoors for too long now. 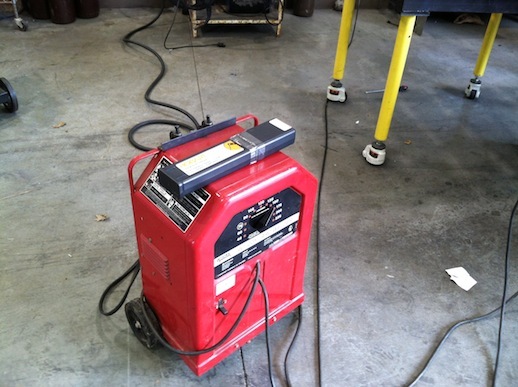 In a job shop environment like mine, mig and tig are the main process. Fabrication, repair, ( a lot of repair ) making prototypes, short production runs of fixtures and clamps, mold repair, tool and die type work, aircraft tooling, etc. all steer you toward mig and tig because of material type or just the need to get a job done quickly. On this job where I was fabricating 6 large fixtures, I was using pulse spray mig. 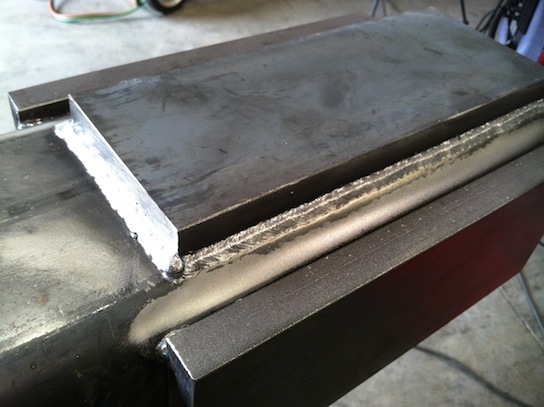 Pulse Spray mig welding is a modified version of Spray transfer where the current is pulsed to control how the molten droplets come off the wire. Pure conventional spray transfer is hot...Sometimes a bit too hot. Pulse Spray is much easier to control for vertical and overhead position welds and since I have this Lincoln Powermig 350mp, I thought I might as well use pulse and dial in some good settings. I was using 90/10 ar/co2 for the pulse process but there are other blends what work. It seems the programs in the machine were done with 90/10 in mind and its a pretty common gas so thats what I have on hand. I remembered back to previous jobs doing some structural welding for pipe supports. Al lot of wide flange I beam type shapes where all sides were welded and inspected after welding. How where those welds cleaned for inspection? Also known as a vibro peen tool, or air engraver. An air scribe with a hard steel or carbide tip does a great job of removing slag from little nooks and crannies. A follow up with a small cup brush on a grinder usually does the trick for removing loose residue and shining up the weld. An air scribe might be overkill for stick welding on the farm, or in the garage but its great for coded work that will be inspected. So...I figured while I was stick welding, I would go ahead and plug up the buzz box and get some 5/32 7014 and give them a go too. I chose 5/32" rods because they allowed me to weld the entire long side of the thick counterweight plates without a tie in. And you know what? they worked out ok. A bit of spatter but it all wire brushed off in no time to leave some shiny uniform welds. Even if you mig and tig all the time, dont forget about stick. Stick welding can get you out of a jam sometimes. And there are times when a stick rod is the only thing that will fit into a tight space.